The optional sunroof will not be electronically operated, and is part of a host of other accessories that Tata Motors has added for the Nexon sub-compact SUV. 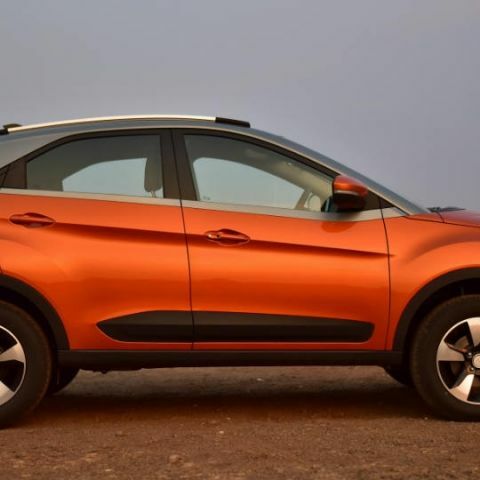 Tata Motors has added an optional sunroof to its sub-compact SUV, the Tata Nexon. The sunroof is part of a new set of accessories that the company has announced for the Nexon. However, it will not be an electronically operated sunroof, unlike what you would have seen in most cars equipped with sunroofs. The sunroof is not being restricted to the top variants, and can be added to any variant of the Nexon for an additional Rs. 16,053. While aftermarket options have always been around for any car to add a sunroof, having an official accessory from Tata Motors will answer any questions pertaining to fitting and operation issues. The kit of accessories of which the sunroof is a part of also include chrome garnishes for the honeycomb front grille, headlamp and tail lights, trims around fog lamp and rear bumper, chrome door handles, DRLs, a side step, mud flaps, cornering sensors to the front and illuminated front logo on the grille. On the inside, you can also equip your Nexon with leather seat covers, ambient lighting, special floor mats and even illuminated scuff plates and puddle lights. The overall package is aimed at making the Nexon more premium by offering a bunch of equipment from higher tiers. The Tata Nexon is powered by 1.2-litre petrol and 1.5-litre diesel engines, along with options for six-speed manual or AMT gearboxes. The Nexon falls in the sub-compact SUV category, where it competes with fellow compact crossovers like the Maruti Suzuki Vitara Brezza and Honda WR-V. Interestingly, the Honda WR-V offers a bunch of upmarket features as standard in its higher variants, which also include an electronically-operated sunroof. At present, the WR-V and the Nexon are the only two cars that offer a sunroof in the sub-10 lac category, which can be an alluring factor for many car buyers in the country. Which laptop should i buy which can do animation and 3d rendering as well as on which i can game on?